Autumn officially began on September 22. For some plants, the angle of the sun tells them what season it is. Others rely on the temperature. In any case, at this time of year, deciduous trees drop their leaves to prepare for winter. 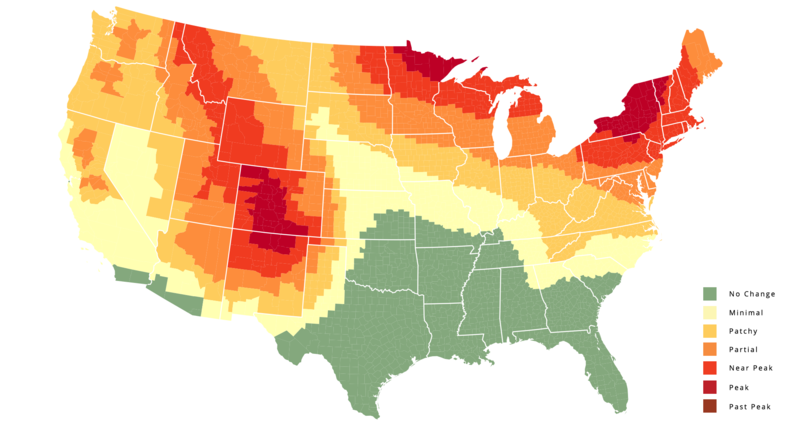 The 2018 Fall Foliage Prediction Map at Smokymountains.com has a week-by-week interactive map showing regional peak colors for the United States. (See photo above, which is for October 8.) The web page also explains the science behind falling leaves and has downloadable coloring sheets for children. Years ago, I witnessed something that showed me the power of trees — not their strength but their autonomy. The air could not have been more still that autumn morning, yet a tree near my back door was losing its leaves. One by one, they fell of their own weight as the tree let go. Leaves dropped steadily and eerily through the becalmed air. Usually we think the wind sweeps the autumn leaves from the trees, and maybe it provides an extra tug. But trees decide to shed their leaves at the moment they deem best. Though they seem almost inert, buffeted by wind, soaked by rain, baked by sunshine, and parched by drought, they control their fates as much as any of us. We, too, can be uprooted by disasters, attacked by illness, cut down by predators, and suffer wilting thirst. Being mobile does not make us less vulnerable. Or more willful. So on that cool morning, I watched a tree prove that it was the master of its destiny. One by one, it clipped its bonds to its leaves, and they dropped off. The tree was taking action, and no one and nothing could stop it. If you’re here because I wrote the novel Semiosis, welcome! You might also enjoy the website devoted entirely to the novel. It has a blog, scenes that didn’t make it into the book, short stories, essays, and the full Constitution.